One of the worst parts of being in the hospital is having to stay in bed for constant monitoring – even having vital signs taken intermittently can be a nuisance. This wearable health monitor from Sotera Wireless lets patients go about their days without the hassle of being poked at and bothered by staff taking their vitals every hour. 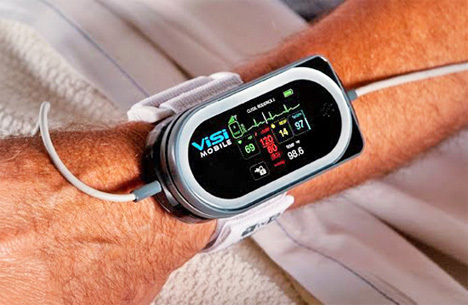 Just a little bulkier than a wristwatch, the ViSi Mobile Monitor straps onto the patient’s wrist easily for constant remote monitoring of their state of health. The ViSi monitor constantly measures the patient’s heart rate, temperature, blood pressure and respiration rate – all without disturbing the patient in any way. The vital signs are sent wirelessly to the doctor’s or nurse’s smartphone, tablet or computer. The clinician can keep an eye on the patient’s state of health without ever disturbing the patient, and the patient can continue to move around more or less normally. Sotera Wireless has already gotten FDA approval to sell the ViSi monitor to hospitals, so patients should soon get to enjoy a newly-increased amount of mobility. See more in Various Gizmos or under Gadgets. January, 2013.